We’re kicking off this year’s series of research seminars with a double header for next week! 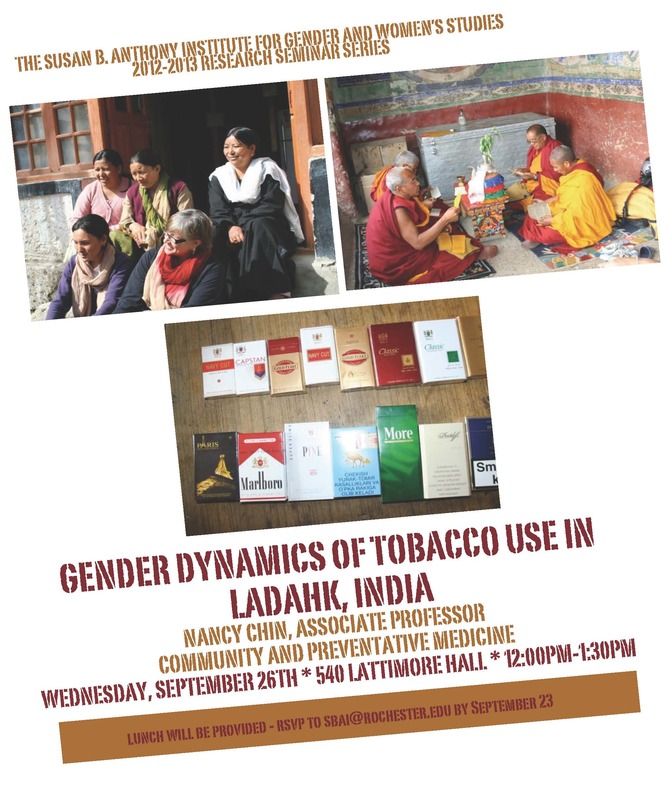 On Wednesday, September 26 at 12pm Dr. Nancy Chin, Associate Professor of Community and Preventative Medicine, will share from her ongoing work, “Gender Dynamics of Tobacco Use in Ladahk, India.” Her research, spanning over several years with different research teams, involves social and cultural data around tobacco use in a remote area of India. SBAI was able to support Dr. Chin’s research through research grants for both her program and for several of her undergraduate research team (including one of our women’s studies minors!). The researchers have been particularly interested in attitudes and ideas about smoking in relation to cultural gender norms and the differential rates of smoking between men and women across cultures. A vegetarian lunch will be provided – please RSVP to sbai@rochester.edu by September 23. This entry was posted in SBAI Events and tagged #culture, #india, #nancy chin, #research, #tobacco. Bookmark the permalink.